Lets get the party started! 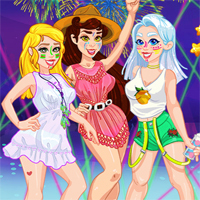 Crystal, Olivia and Natalie are going to go to a music festival party and you get to organize the event, pick out decorations, and help them get dressed up with some lovely festival fashion. Put on some music to dance to, play with colored spray cans, and take a picture so they can remember this awesome concert!